CONTENT Dreamwork China is a 2011 documentary by Tommaso Facchin and Ivan Franceschini. In the suburbs of Shenzhen, in Guangdong province, young workers talk about their lives, existences built on a precarious balance between hope, struggles, and wishes for the future. Around them, activists and NGOs strive to give sense and meaning to words like rights, dignity, and equity. 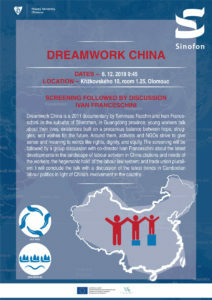 The screening will be followed by a group discussion with co-director Ivan Franceschini about the latest developments in the landscape of labour activism in China.